Join us for what’s sure to be an awesome night in AI! 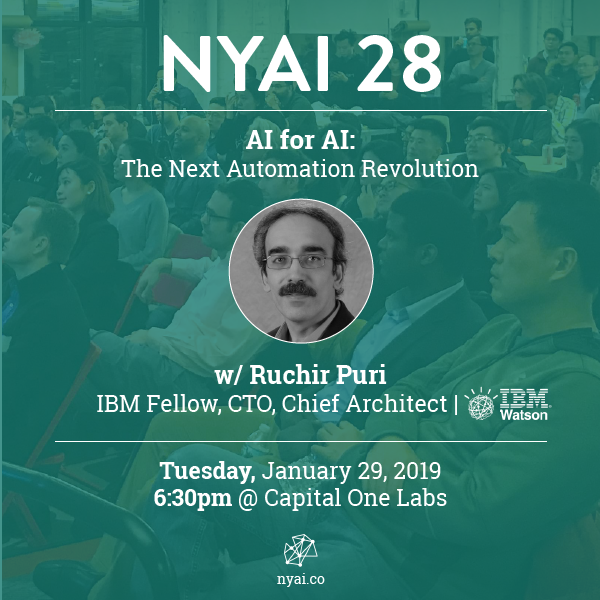 This month’s event is focused on AI for AI: The next automation revolution w/ Ruchir Puri (CTO & Chief Architect, IBM Watson; IBM Fellow). Application of neural networks to a vast variety of practical applications is transforming the way AI is applied in practice. Pre-trained neural network models available through APIs or capability to custom train pre-built neural network architectures with customer data has made the consumption of AI by developers much simpler and resulted in broad adoption of these complex AI models. While prebuilt network models exist for certain scenarios, to try and meet the constraints that are unique to each application, AI teams need to think about developing custom neural network architectures that can meet the tradeoff between accuracy and memory footprint to achieve the tight constraints of their unique use-cases. However, only a small proportion of data science teams have the skills and experience needed to create a neural network from scratch, and the demand far exceeds the supply. In this talk, I will describe the next revolution in automating AI and discuss NeuNetS – an automated Neural Network Synthesis engine for custom neural network design – which strives to build neural network designs for specified tasks and with performance on par with human-designed AI models. Ruchir received Semiconductor Research Corporation’s outstanding mentor award. He was a visiting scientist at the Dept. of Computer Science, Stanford University, CA, and an adjunct professor at the Dept. of Electrical Engineering, Columbia University, NY and was awarded John Von-Neumann Chair at Institute of Discrete Mathematics at Bonn University, Germany. Ruchir received the 2014 Asian American Engineer of the Year Award. He has delivered numerous keynotes and invited talks at major software and hardware conferences. He is an inventor of over 50 United States patents and has authored over 100 publications as well as authored a book on Analyzing Analytics. Ruchir is an active proponent of technology among school children and has been evangelizing fun with electronics and FIRST LEGO LEAGUE Robotics among middle schools children.